As you no doubt have gathered from the incessant -- and let's face it, often biased -- media coverage, Doug Winship, one of the 20 most important people* on the Web when you need to make a drink (#37 on the metric system for those of you who have embraced the fad) hath declared that February is Tiki Month. Because he is a pal, and because this is the one time of the year (except for Christmas, when he shows off his new toys from Santa) when he remembers how much fun it is to blog (in a one horse open sleigh, see above) I cooperate. This year, I decided to go a bit more in depth than I usually do. 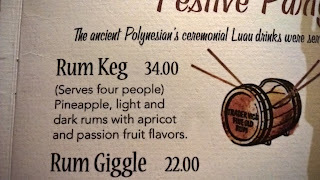 Prompted by a visit to Trader Vic's London** location, where the Rum Keg is a marquee attraction I decided to focus on said drink for Tiki Month, with a couple of side detours into other branches of its family tree, basically all those drinks that are called Rum [Insert Type Of Container Here]. 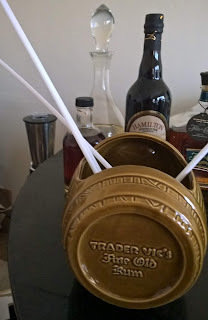 Rum Barrel, Barrel o' Rum, Rum Cask, Rum Hogshead, Rum Aseptic Tank, Rum Vat, Rum Storage Unit, etc. 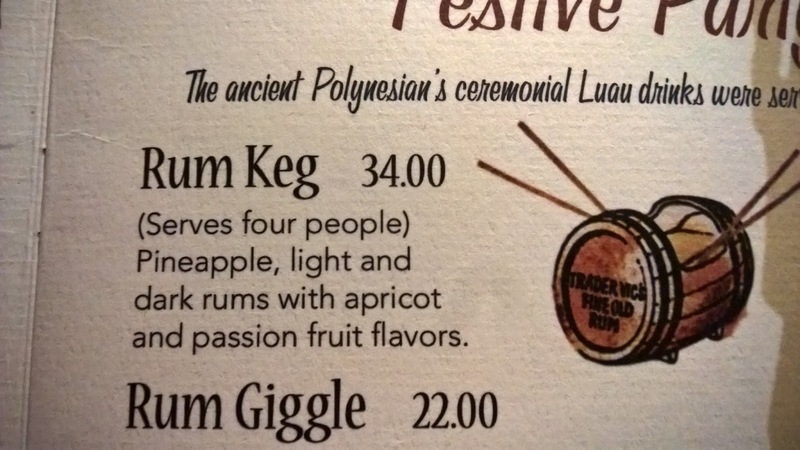 So I decided to research the Trader Vic's Rum Keg a bit further. As we discussed last year, Trader Vic was a bit sneakier than Don the Beachcomber when it came to keeping his recipes secret. Don just encoded them, and relied on relabeled bottles that hid the nature of the ingredients, brands, syrups and mixes. Vic, I suspect, was of the "ain't nobody got time for that" school of thought. Vic PUBLISHED his recipes, repeatedly. But when you made them at home, even if you were following the instructions closer than someone allergic to peanuts reading the Epi-pen(tm) manual after eating a PB&J, they didn't quite taste right. 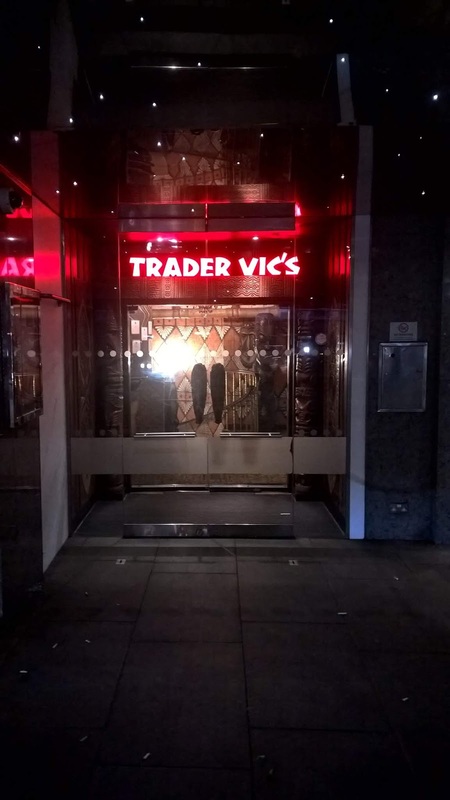 That's because Vic's published recipes were slightly off. On purpose. Someone at home (or better yet, at a competitor's bar) made them, and they tasted kinda-sorta-maybe like Vic's but never as good. 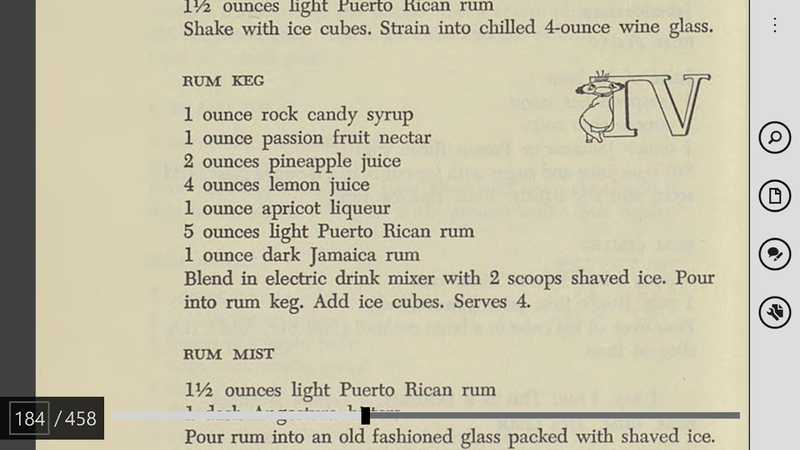 A couple of years ago, Jeff Berry and I were comparing Vic's recipes for the Mai Tai from his books and from letters and postcards he had mailed to friends, we noticed where Vic got sneaky was in the area of syrups and other sweeteners...that's where he practiced his deft misdirections. 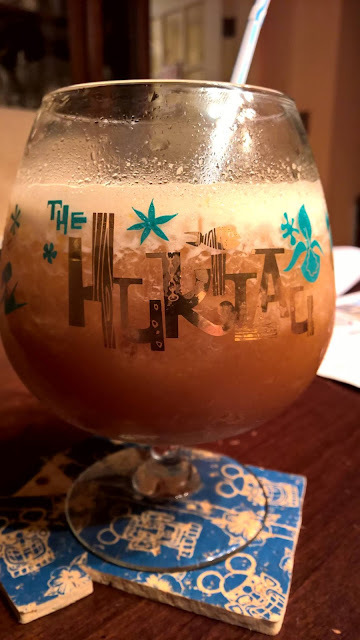 So, when I went looking for Ye Olde Offycialle Recipe for the Rum Keg, I looked at Jeff "Beachbum" Berry's Intoxica, his Tiki+ app, Trader Vic's own books (Book of Food & Drink, and the Bartender's Guide, Revised) and the usual other sources online. I found several, all of them very similar but -- and watch this, now -- NOT IDENTICAL. Some called for passion fruit nectar, others for passion fruit syrup. Some called for sugar syrup (no ratio given, but let's all pretend that's meant to be 1:1 sugar to water, unheated), others for simple syrup (generally accepted as 1:1, heated to dissolve), and still others for rock candy syrup (which is supposedly 3:1 with or without a molecule of vanilla, but is sometimes lumped in with "rich [simple] syrup" at 2:1). So, two kinds of passion fruit and three kinds of syrup, etc., etc. A zillion variations, never minding the possible inclusion of vanilla. You will notice, kind reader, that when I post a recipe of mine for something involving some variant of sugar syrup, I never, ever, ever use a name ("rich syrup") but, rather, the ratio of sugar to water. This is because I am old fashioned enough to believe that numbers are more accurate than names at conveying numerical information. I'm no doctor, but I think that's how it's supposed to work. Kind of like the correctly derided "juice of one [fruit]"...we have numbers and vessels of measurements for a reason. Then there are the variations on the lemons (Eureka or Meyer lemons?) apricot "brandy" (Giffard? Luxardo? Some other, maybe bottom shelf denizen?) 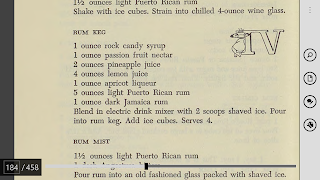 Which rums? 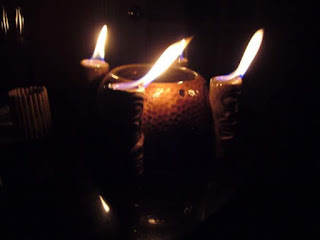 In my next post, I will run through the experiments. * If you don't believe it, just ask him. ** There's a story, too.